Each ball of clay is wedged to prepare it for throwing on the wheel– we use a combination of new and recycled clay. We buy the clay locally from a company that mixes up the clay from raw materials mined from around North America. The clay needs to be wedged to make sure there are no air bubbles captured inside. 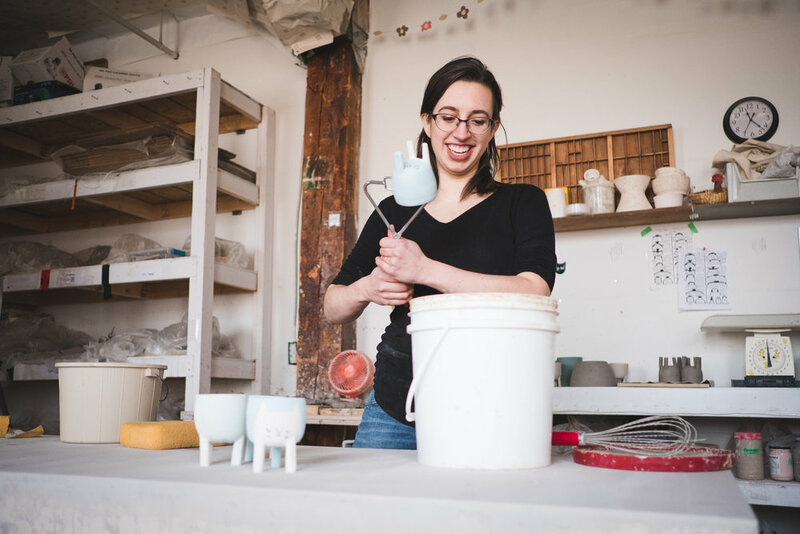 Alicia throws most of our pieces individually on the wheel (mugs, planters, plates), while others are slip-casted using handmade moulds, or are shaped by hand using wedged clay. All of our wheel-thrown pieces are allowed to dry for about a day and then are put back on the wheel to trim– in this photo Alicia is trimming the bottom of a large three-legged planter. 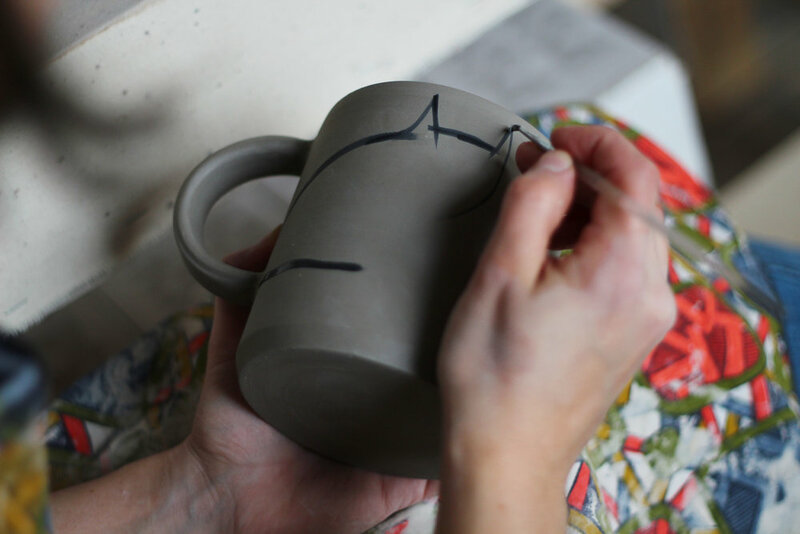 Alicia applies the mug handles and planter legs, smoothing them out to prepare them for dipping in colour. This photo shows a planter getting its legs put on. The colour we use is called engobe, which is basically liquid clay tinted with pigments. Many of our designs are applied using paper resist, which involved reusing old newspapers to cut out a shape, apply it with water to the piece, dip it in engobe, then peel off the paper to reveal the white clay beneath the shape. This leaves a really nice texture where the two layers meet. Some pieces, like our cat mug with the tail on the handle, are completely painted by hand, so each one is completely unique and has its own personality! Other pieces have hand-painted details in addition to the engobe dip. These details, like faces and outlines, are hand-painted on with a tiny paintbrush. The pieces are set on a shelf to fully air-dry and then head into the kiln, where they are fired to 1950°f! This gets all the water completely out of the clay. After they cool down, we go over each piece to check for defects, and sand away any smudges or rough bits that we didn’t catch before the firing. Every piece is dipped in a hand-mixed, non-toxic transparent glaze. The glaze we use, once fired, completely seals the piece, so that everything we make is dishwasher and microwave-safe. The pieces head into the kiln once more for the glaze firing at 2200f°! All of our pieces are given one more look-over to make sure no cracks or imperfections have shown up in the last firing. After they get the O-K, we package them up to be sent in the post to you, or to travel safely to our next show. We are continuously working on new designs and phasing out old ones. Alicia loves the process of turning a 2-dimensional drawing of Josiah’s into 3-dimensional reality for the first time!